Today I receive a question about how disable the vcl styles in the non client area of a vcl form. Well that can be done using a Style hook. To remove the vcl style in the non client are we need create a style hook which descend of the TMouseTrackControlStyleHook and then override the PaintBackground and Create methods. Project Project1.exe raised exception class $C0000005 with message ‘access violation at 0x0057019a: read of address 0x00000000’. Vcl.Styles,//the vcl styles unit is declared before of your main form. 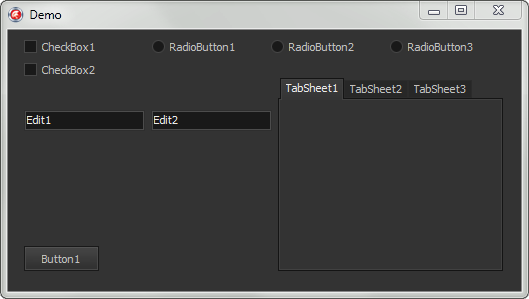 (listbox, because TTreeViewStyleHook bugs with the scrollbars a bit), Anyway idea is to apply vcl style to the 3rd party component, it works great for the scrollbars which is what i want, but when vcl styles are enabled the VirtualTreeView flickers alot when the form is resized.. any hidden magic to prevent that or ideas ? it has to do with the repainting the control and the hook..but ? :) .. He had problems using the VCL component TRibbon with Styles. The top edge of the screen was all wrong. Take the test yourself. But with this solution you have implemented solve the problem. I created a unit for class “TFormStyleHookNC” and made the call “TStyleManager.Engine.RegisterStyleHook (TForm1, TFormStyleHookNC)” in the project file (. dpr) after the begin. It worked perfectly. Thank you Rodrigo for this hook ! I have a question : how to apply this hook to “MessageDlg” and “ShowMessage” (…) ? If you are using the update 4, is more difficult because the StyleHook inheritance not work correctly (check this QC http://qc.embarcadero.com/wc/qcmain.aspx?d=104035), So the only alternative is use a code like this. 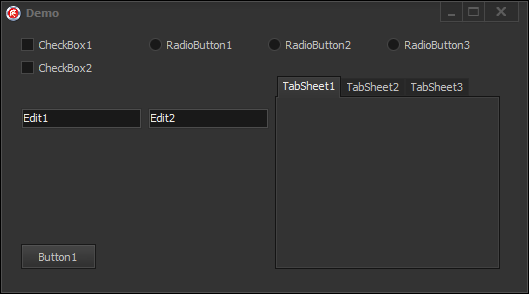 well, how to enable vclstyles only for some control(controls) ? hi. if i use this hook i have problem with TMainMenu. how can i use TMainMenu with this hook? The TMainMenu is outside of the scope of this hook, so you have two workarounds , 1) implement the TMainMenu Style hook inside of the TFormStyleHookNC class just how is made in the TFormStyleHook style hook, 2) or replace the TMainMenu for the TActionMainMenuBar component.